On June 5-6 2012, SDO is collecting images of one of the rarest predictable solar events: the transit of Venus across the face of the sun. This event happens in pairs eight years apart that are separated from each other by 105 or 121 years. The last transit was in 2004 and the next will not happen until 2117. This image was captured on June 5, 2012. 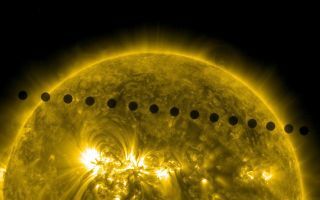 On June 5-6 2012, SDO collected images of one of the rarest predictable solar events: the transit of Venus across the face of the sun in this cool space wallpaper. This event happens in pairs eight years apart that are separated from each other by 105 or 121 years. The last transit was in 2004 and the next will not happen until 2117. This image was captured on June 5, 2012.